For persons who are truly passionate about that great California chardonnay, or who simply cannot imagine a night without a nice, full glass of the best wine from France, Wine Cooler Direct is their vendor. 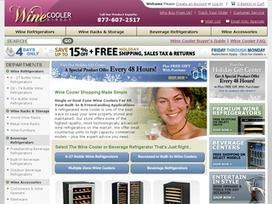 Wine Cooler Direct provides its customers with the best options in wine storage, wine accessories and wine cooling. The experts at Wine Cooler Direct are able to point customers in the right direction so that they can purchase the equipment they need -- whether that be a residential wine refrigerator to complement the home bar, or a large commercial storage unit. At Wine Cooler Direct, customers have become accustomed to the fact that they can receive exactly what they need for wine storage at a fair, competitive cost. Popular products from Wine Cooler Direct include single-bottle chillers, which are perfect for any kitchen countertop, wine refrigerators that can hold between six and 27 bottles, and wine refrigerators that hold up to 70 bottles of wine. For the true enthusiast, or perhaps a commercial business owner who needs to store large amounts of wine, Wine Cooler Direct also offers customers multiple zone wine coolers, and refrigerators that can store more than 75 bottles of wine. Built-in coolers and refrigerators also are available, so that your wine-storage needs will fit in perfectly with your home decor or business atmosphere. In addition to many different wine storage and cooling options, Wine Cooler Direct offers customers a wide variety of wine accessories. These accessories include wood and metal wine racks, which can be a decorative way to store and display your favorite bottles of wine, as well as wine cabinets, bar tables and bar furniture. These products are perfect for the wine lover who has a wine cellar in her home, as well as the commercial business owner who may need these wine accessories for business purposes. Wine Cooler Direct offers simple and affordable wine products, and shopping with Wine Cooler Direct online will save customers both time and money. By shopping online for wine products, customers are able to choose from a variety of different wine coolers and wine accessories in one quick, easy shopping experience. These products can be hard to find in stores, and most stores that do carry these items will not have a wide variety of wine cooling products and wine accessories. That's where customers benefit from shopping for all their wine supply needs through Wine Cooler Direct. Wine Cooler Direct is a popular outlet where wine lovers across the globe can purchase the things they need for their personal wine collections and wine storage areas. Whether they enjoy a bottle every once in a while or a bottle every night, Wine Cooler Direct has wine refrigeration and storage options to suit them and all of their wine needs, as well as the perfect accessories to complement their collections of wine. Share what you think about WineCoolerDirect, and your favorite ways to save there!